What type of regular maintenance is required for the CX1200? > Knowledge base> Article: What type of regular maintenance is required for the CX1200? 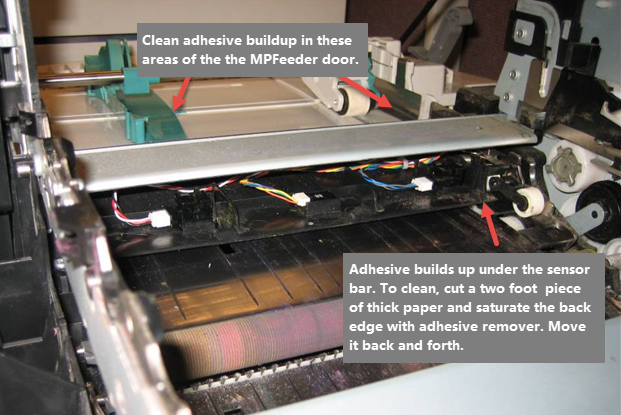 Almost all of the maintenance that would be required to keep the CX1200 running smoothly could also be accomplished simply by replacing the components that touch the paper. In other words, simply replace the ITU and or Fuser. Clean the adjustable green guides on the MP Feeder tray where you load the label stock. Also clean off any paper dust from the white drive roller. This roller should be tacky. If excessive amounts of adhesive are building up regularly on the green guides, that would be a sign that the type material should be adjusted. We recommend “dry edge” label stock where the adhesive does not extend all the way to the edge of the material. You really want to minimize adhesive build up on the guides. The adhesive build up is not a problem on the guides themselves because they can easily be cleaned. However, there are other areas in the printer that could also be gathering adhesive. These areas, such as the fuser drive assembly area, are NOT accessible so they cannot be cleaned. A dirty printhead lens can lead to poor print quality. When experiencing poor quality the first step to take is cleaning the printhead lenses. 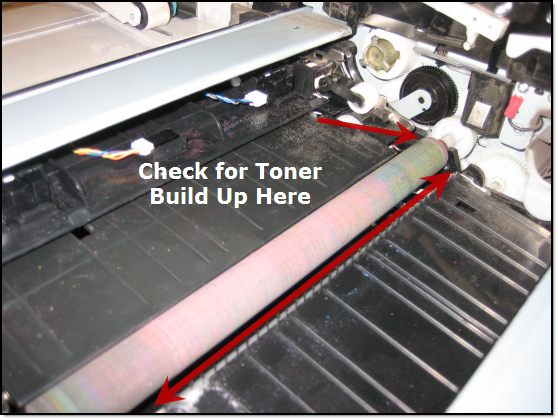 Each toner slot has its own printhead lens. 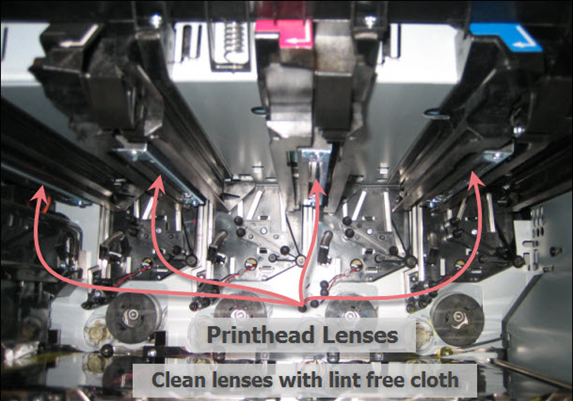 Clean each printhead lens with a soft lint free cloth. 1. Remove the Cartridges and ITU as described in the manual. 2. Inspect the second transfer roller area. 3. Look for toner build up next to and underneath the roller. Especially look for any toner build up near the back of the printer by the white gear. Remove any toner found here with a toner vacuum (HEPA Filter Vacuum). 4. Once the ITU has been removed, place it face down on a table so that the bottom is visible. 5. Push the Wiper blade housing down as shown below to expose the wiper. 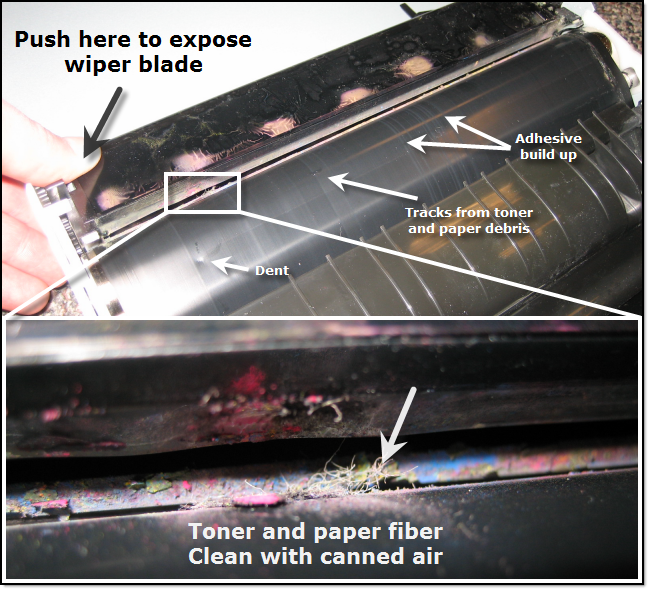 Check for toner or paper debris that is lodged in, on or behind the wiper. Clean with canned air. Be sure to wear proper breathing protection to prevent inhalation of toner dust. 6. Also, inspect the ITU belt for tracks, adhesive build up or dents. See above. If any of these are severe and in a printable area of the ITU, you will need to replace the ITU. 7. 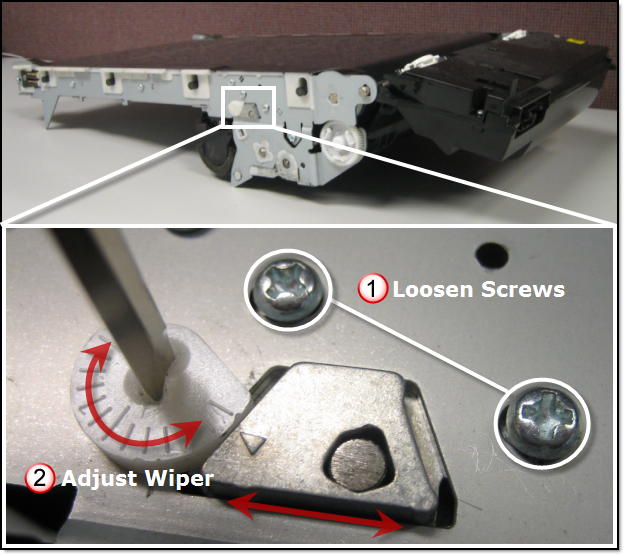 Finally, if the ITU belt looks acceptable and the wiper is clean, try adjusting the wiper blade tension. This will affect how the wiper blade cleans the ITU. In the picture below the tension is set to the highest point. This is typically set to the middle point at the factory. You can increase or decrease the tension. After you have set the tension, tighten the screws indicated below. 1. Remove the fuser using the instructions in the manual. 2. Remove the heat roller cover by pushing the release latches. 3. Inspect the heat roller for any adhesive build up or cracking. The fuser pictured below is in perfect condition. 4. Adhesive build up can be cleaned with isopropyl alcohol. If the fuser heat roller is cracked or wrinkled you will need to replace the fuser. What are the recommended storage and use conditions for CX1200 label stock and toner cartridges? 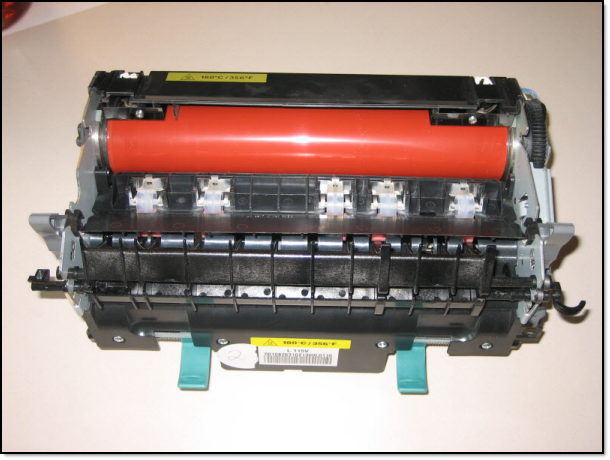 How often do I need to replace the CX1200 ITU, Fuser and Waste Toner Receptacle?